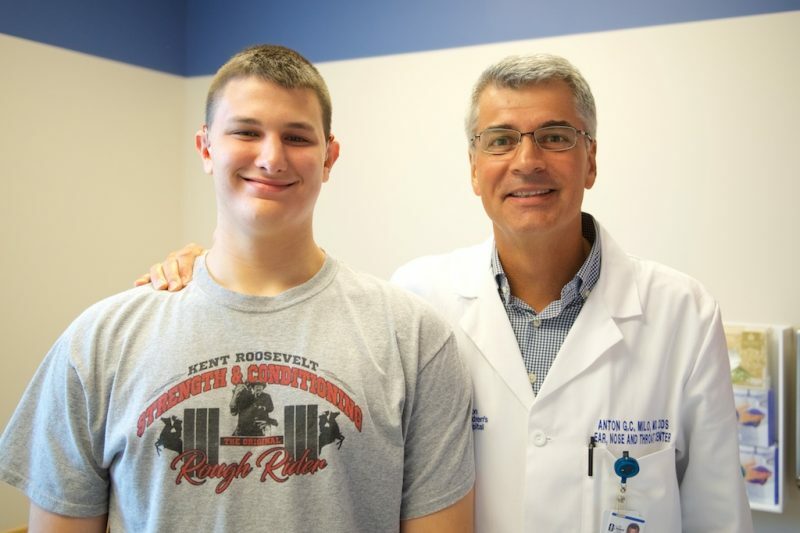 Dr. Anton Milo has been caring for Joe Gavriloff since Joe was in preschool. 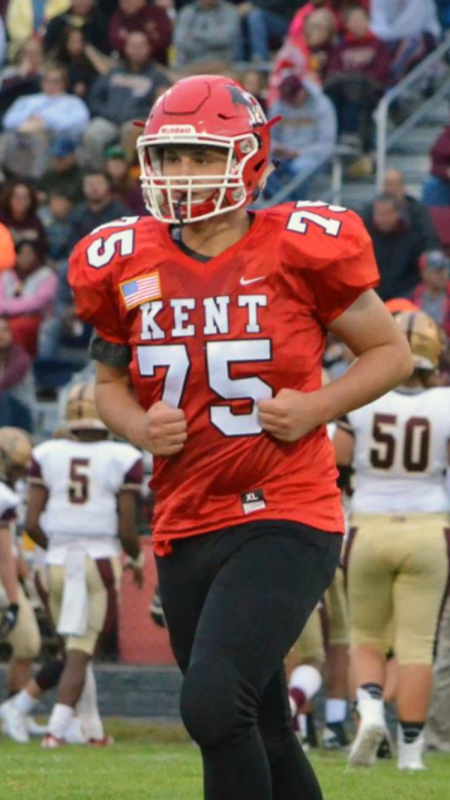 Now, the high school sophomore at Kent Roosevelt is getting football advice from his doctor. My little Joe. It is hard to believe that my son – 6 foot, 4 inch tall and size 17 shoe – was 5 pounds, 8 ounces when he was born. His early childhood was typical, with nothing of major concern except that he and his twin, Elizabeth, had their own language for a time. Joe has been playing football since he was young. In preparing for kindergarten, Joe’s preschool did a hearing test, and he failed it. That was January. We made an appointment to see Dr. Anton Milo, director of Akron Children’s Ear, Nose & Throat Center. At that visit, Dr. Milo said he lost a little hearing, so he wanted to see him back in 4 weeks. Four weeks later, 2 weeks before he turned 5, our world was turned. When they rechecked his hearing, it was significantly gone. Dr. Milo looked concerned, and we were scared so a CAT scan was ordered. The CAT scan was normal and Joe got his hearing aids. I’ll never forget Joe telling me, “Thanks, Mom, I can hear again!” and jumping out of the chair to play with his twin. That put Joe’s life all in perspective for me. Joe went to kindergarten. He played with his friends, and he wanted to play sports with them, too. We thought if he wanted to play a sport, we should not hold him back. He played soccer, baseball, basketball and football. We saw his hearing aids much like wearing glasses, contacts, braces, etc. It was different but the same. That was Joe’s attitude, so it was our attitude. He played flag football in his early years, and then as he grew bigger, he played pee-wee football. I was nervous, because we knew once he played pee-wee there was no way to wear the hearing aids. As I think about that now, Joe never does not hear Mr. Anderson, even to this day. Mr. Anderson made sure his son CJ, who was the quarterback, looked at Joe to tell him the plays. He made sure the other lineman, especially Nick Rothaermel, told Joe if there were changes. Joe did fine. He had fun. Middle school was the same and then it was high school. As big as Joe is, we knew he wanted to play football in high school. High school was going to be different, so we asked Dr. Milo for help. How do you prepare for a big stadium and lots of noise? Dr. Milo gave Joe advice on how to talk to the coaches and what he will need to be successful. Dr. Milo advised Joe to be his own advocate. He encouraged him to speak up if he couldn’t hear. The good thing is that the players he has played with, CJ, Nick and others, still work as a team and keep Joe in the know. 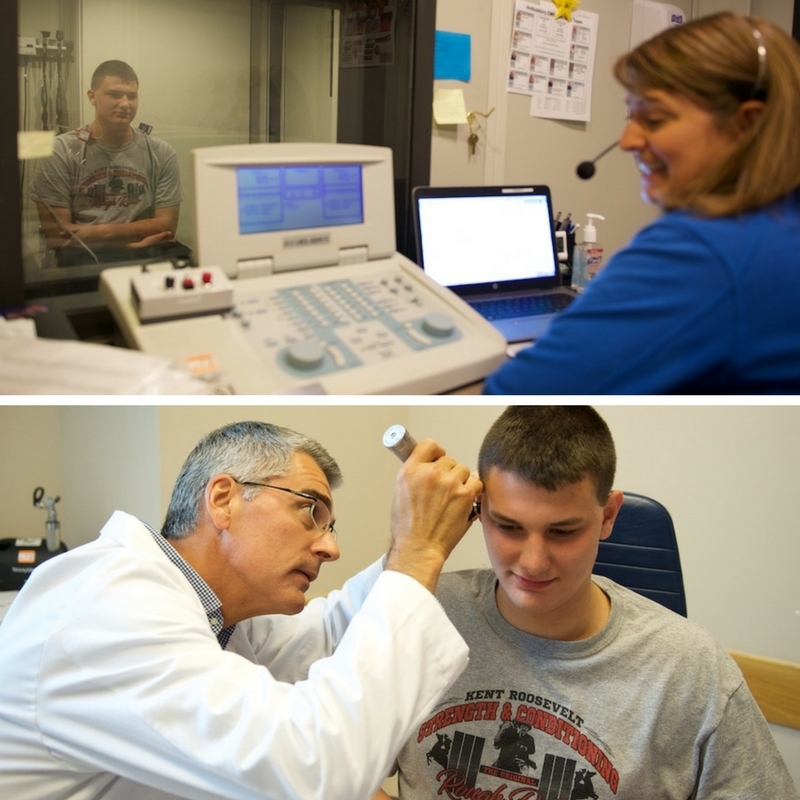 Joe had a check up this summer with Dr. Milo and Audiologist Shelley Duncan. Joe has that same attitude he has had since he was 5, and it applies today. If he wants to do something, he does it. It may take a little more work for him to do it, but he’s never been afraid of working hard. He knows that hard work leads to good things. Why should being deaf be any different? He plays football, lacrosse and even sings in the choir (though we are not sure if he can sing in tune). The only problem we have, now, is that he is a typical 15-year-old boy. Sometimes he “chooses” not to listen about cleaning his room by taking out the hearing aids. That does not stop mom or dad. We make sure he hears us just fine.